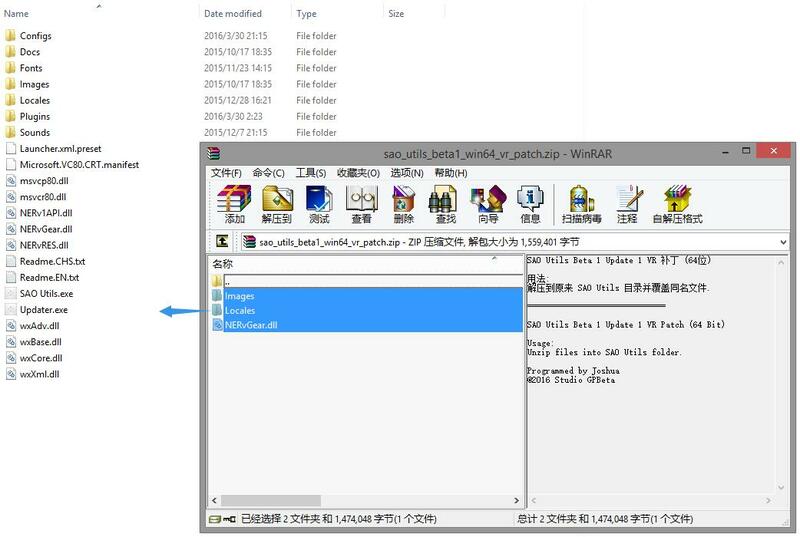 Get SAO Utils Beta 1 Update 1, unzip it to somewhere and install the plug-ins in your favor such as [ Web Browser Engine ]. 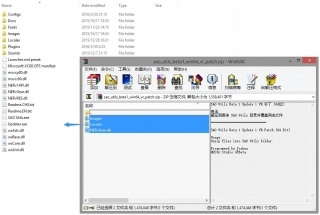 Decompress all the files in the zip to the root folder of SAO Utils, that’s all. 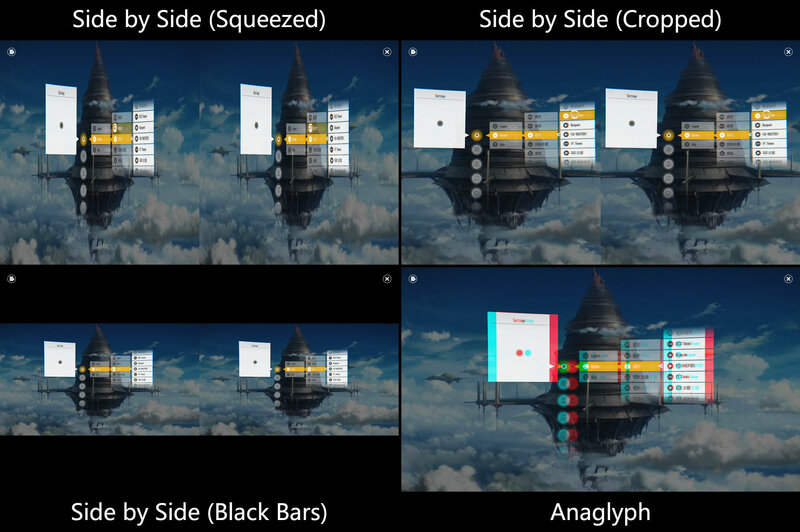 Side by Side: Suitable for VR devices, optional cropped/squeezed/black bar modes. 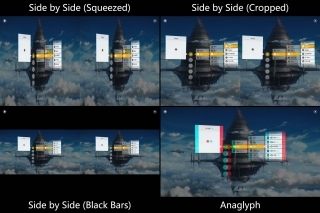 Anaglyph: For anaglyph glasses, supports red and cyan filter only. Different modes are shown in the images above, it’s also possible to adjust the “Zero Parallax” and “Eye Separation” for your comfort. * You must enable the “Compatible” display mode for the best VR experience. 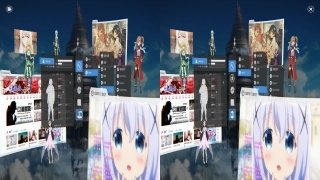 To taste the new VR feature, what we need are just a (DIY) VR box, a smart phone, Trinus VR app and SAO Utils. 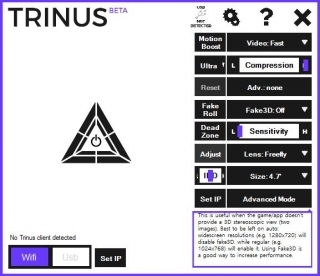 Find and install the Trinus VR Full or Lite version on your smart phone. 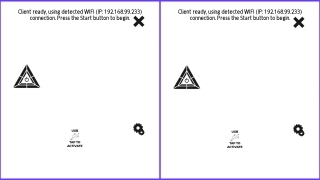 Make sure both your phone and PC are in the same network (WiFi / USB Tethering). Launch the Trinus VR app. Note that the Trinus VR is not the only choice, you can also find other software that could transfer the screen to your mobile device. 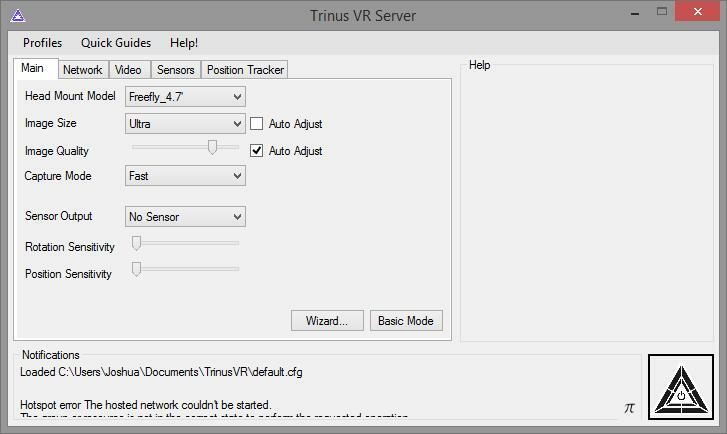 Download the PC SERVER on Trinus VR official web site. Make sure both your phone and PC are in the same network (Again). 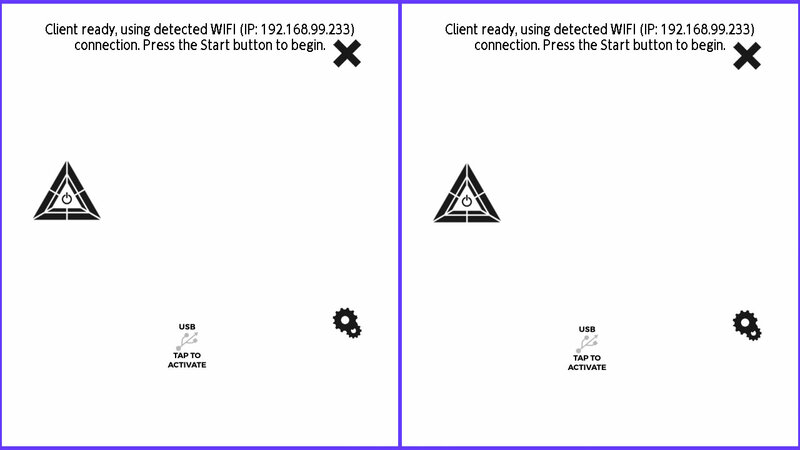 Launch Trinus VR Server, then click △ icon to start a connection with your phone. 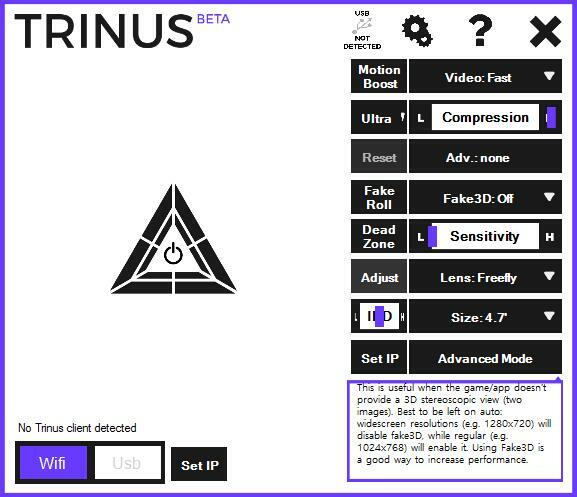 The Trinus VR has varieties of options, you can find them by clicking the setting icon at the top right corner (PC) or moving your head to aim at the setting icon (Phone). 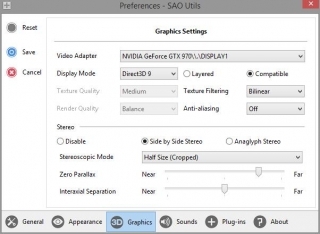 Most of the options require a disconnection before you can change them, and we strongly recommend you to switch to ‘Advanced Mode’ for a more intuitive setting. OK, we’re almost there. 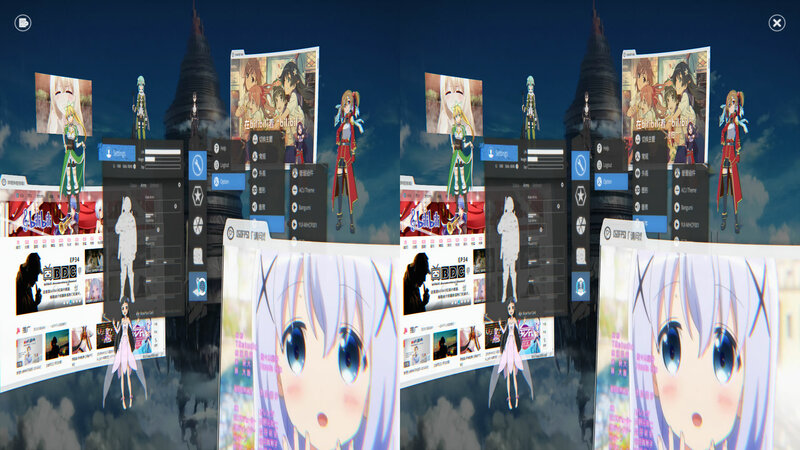 Just align the black line on the screen and place it into your VR headset, wearing it on, calling out the SAO Utils launcher and shout: Link Start!! Actually I don’t have any standalone VR headsets (Ocular Rift, HTC Vive, etc. ), so I can’t test the compatibility with them. If you have one and be willing to share your ideas or advices, please leave us a comment.